I personally love these old fashioned desserts that remind me of my early childhood and church potlucks. And nothing says summer like a pair of cat-eyed sunglasses and pineapple upside down cake…1960’s style. Trust me, I have pictures of my mom to prove it. Updated and gluten and casein-free, I short-cutted this recipe and used a GF Betty Crocker yellow cake mix. You could use any GF mix you wanted (Pamela’s has a bit of buttermilk in hers), and I substituted Mount Ranier cherries for the maraschino style (full of funky dyes and chemicals). Heat oven to 350 degrees. Heat butter or butter substitute in a sauce pan along with agave, whisking until blended. Pour entire mixture 9 inch square pan with sides greased (pyrex works great). 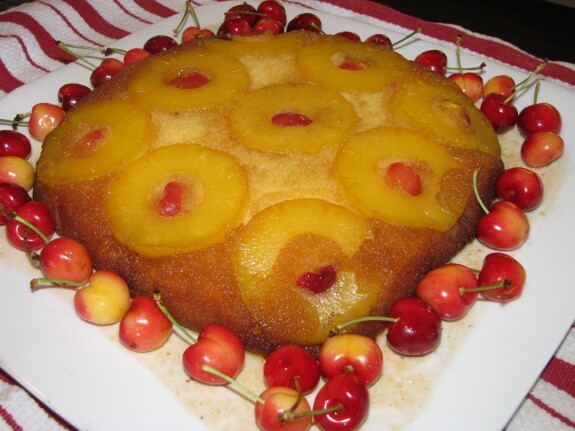 Place 9 slices of pineapple atop butter agave mixture, placing a pitted cherry into the center of each. Make cake according to box, mixing all ingredients together until smooth. Pour batter evenly over pineapple and place into oven for about 40 minutes. Immediately run knife around the sides of pan to loosen and Place heatproof serving plate upside down onto pan; turn plate and pan over. Leave pan over cake for 5 minutes so the butter sugar mixture can drizzle over cake. Remove pan; cool 30 minutes and serve warm or cool. Store covered in fridge. "Cook one time with the same ingredients...gluten-free food the entire family will love." ©2019 Amy's Gluten-free Pantry. All rights reserved. wordpress website by designerchad.com All content on amysglutenfreepantry.com is licensed under a Cre­ative Com­mons License and is the orig­i­nal cre­ation and prop­erty of amy's gluten-free pantry (unless oth­er­wise noted). I am nei­ther a cer­ti­fied nutri­tion­ist nor a med­ical pro­fes­sional of any kind. This web­site reflects my per­sonal views on prod­ucts, ser­vices and per­ti­nent top­ics. My sole pur­pose is to pro­vide help­ful resources and healthy recipes for fam­i­lies deal­ing with cer­tain aller­gies and intol­er­ances. The con­tent of this site is writ­ten by me and rep­re­sents my opin­ions and thoughts, and unless oth­er­wise noted, is copy­righted by amysglutenfreepantry.com. A final note: Con­sider whether you should con­sult a physi­cian before mod­i­fy­ing your diet or fol­low­ing mod­i­fied recipes. This web­site (http://www.amysglutenfreepantry.com) makes no rep­re­sen­ta­tions as to accu­racy, com­plete­ness, cur­rent­ness, suit­abil­ity, or valid­ity of any infor­ma­tion posted here and will not be liable for any errors, omis­sions, or delays in this infor­ma­tion of any losses, injuries, or dam­ages aris­ing from its dis­play or use.